The town of Newport is located between a hilltop and a crossing of the River Usk. Newport Castle was built in the 14th century at this strategically important crossing. The elegant stone bridge of five arches was built around 1800, constructed at the county's expense by architect David Edwards. 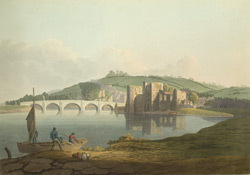 William Coxe, a clergyman who visited here around 1801, considered it a great improvement on the previous timber bridge, which was "ill calculated to resist the height of the tide and rapidity of the stream".